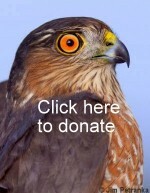 Southern Appalachian Raptor Research (SARR) is an organization of people passionate about birds of all types, including birds of prey and the environments they inhabit in the southern Appalachians. SARR operates MAPS stations, raptor trapping, owl banding, hawkwatch, songbird migration monitoring and public education efforts at Big Bald Banding Station, Cowee, Kituah, and Welch Farm. SARR is a non-profit 501(c)(3) organization, staffed primarily by volunteers that rely on partnerships, grants, foundation gifts and generous private donations to monitor, research and educate the public about the bird communities of the southern Appalachian mountain region. SARR is dedicated to the conservation and protection of birds in the southern Appalachians through monitoring, education and field research.